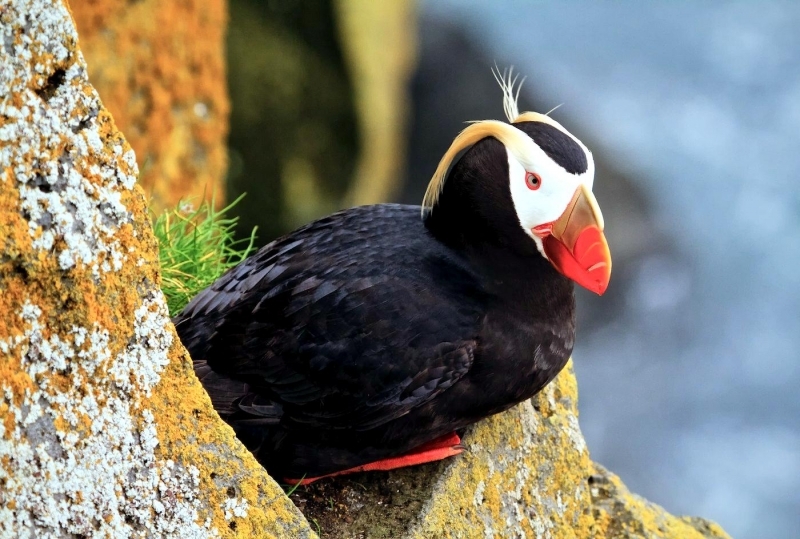 Its bright colors have earned the Tufted-horned Puffin the nickname “Parrot of the Sea” but this beautiful seabird is at home on land as well. 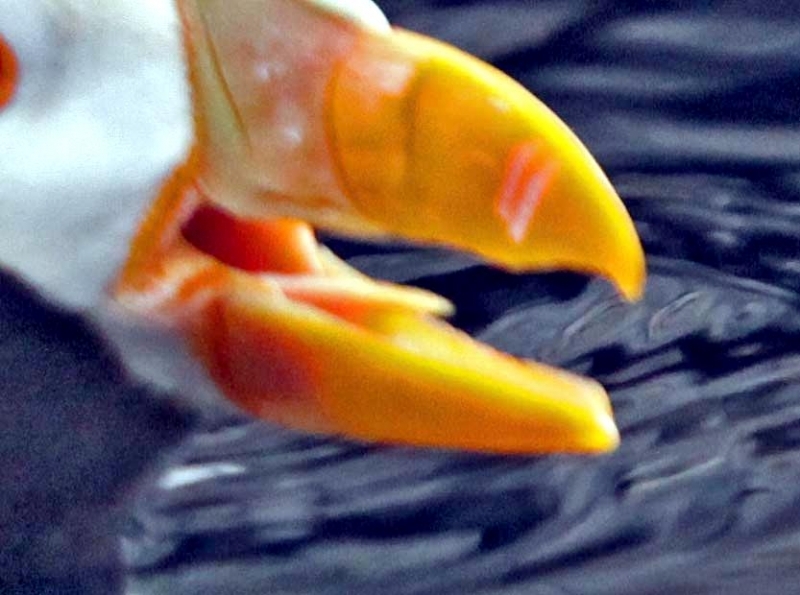 In early spring, its beak and feet turn a vibrant orange in preparation for breeding season, but in winter they fade to duller shades of their summer color. 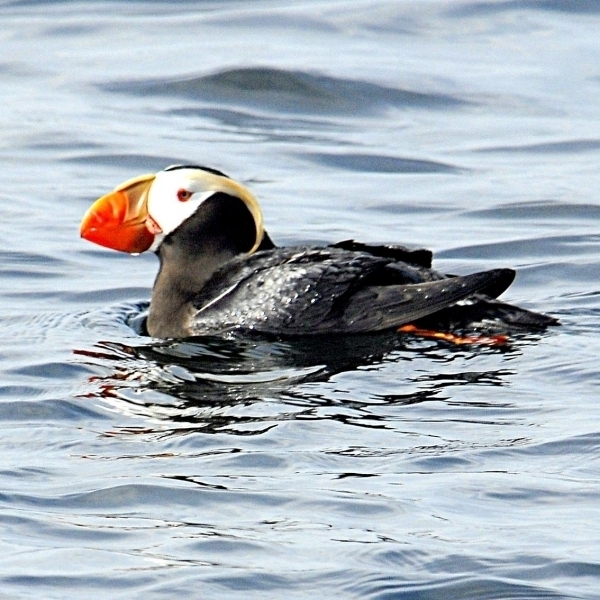 Juveniles are less colorful than adults. 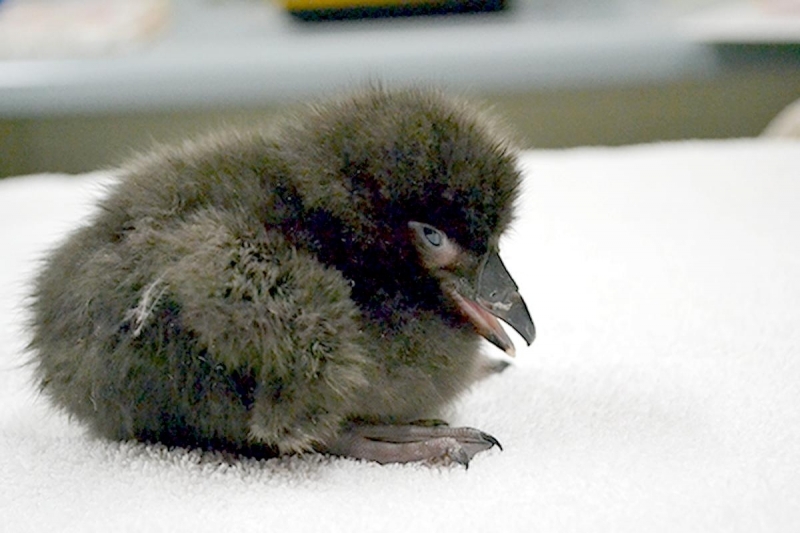 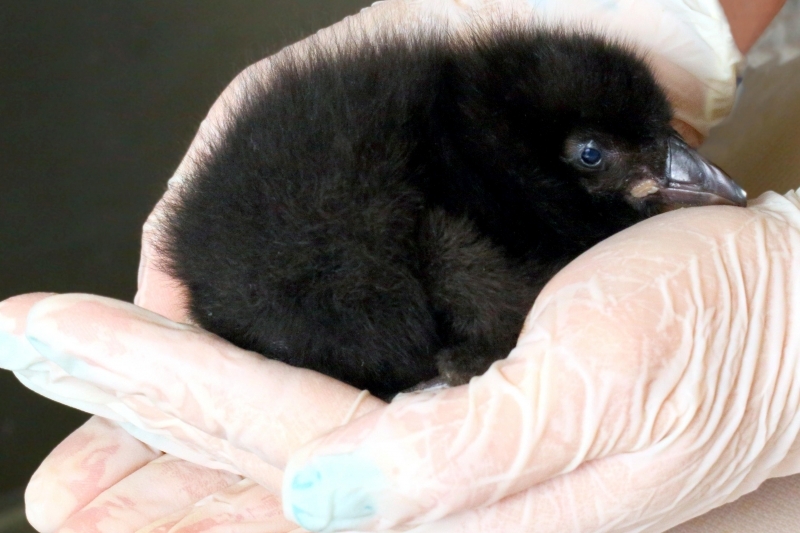 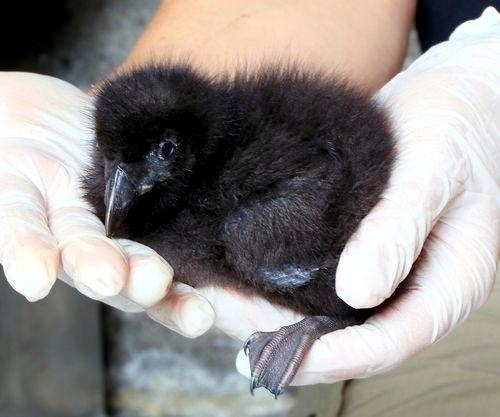 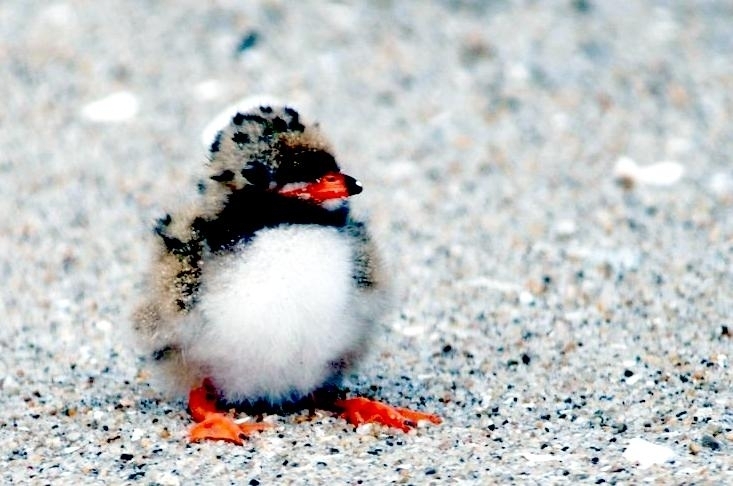 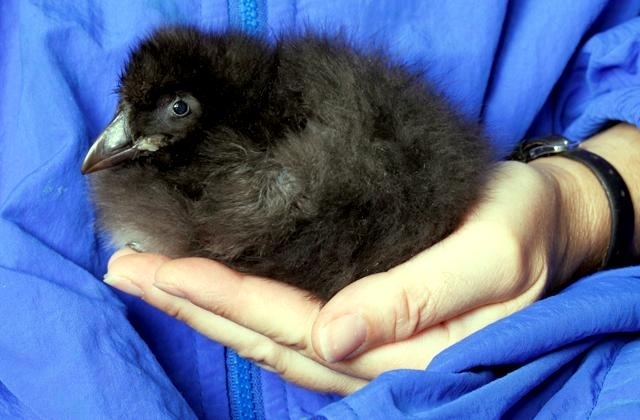 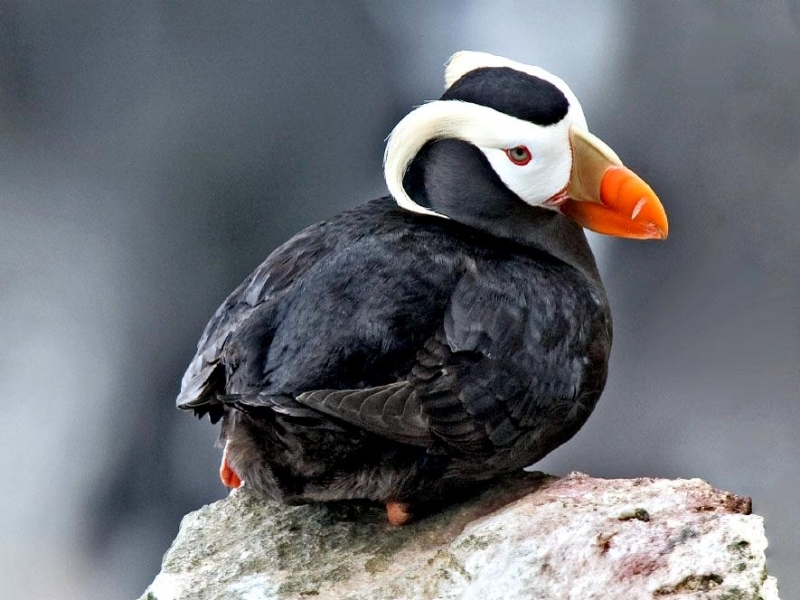 The word “puffin” is thought to be derived from the word “puff” which refers to swollen and it is the Puffin chick that contributes best to this name because of its round, puffed look resulting from its dense cover of down feathers – an adaptation for retaining body heat while the parent is off fishing. 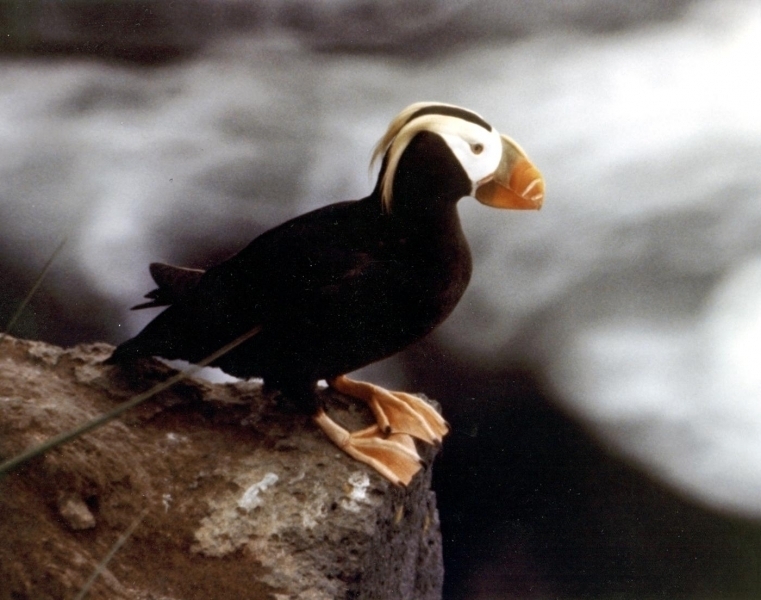 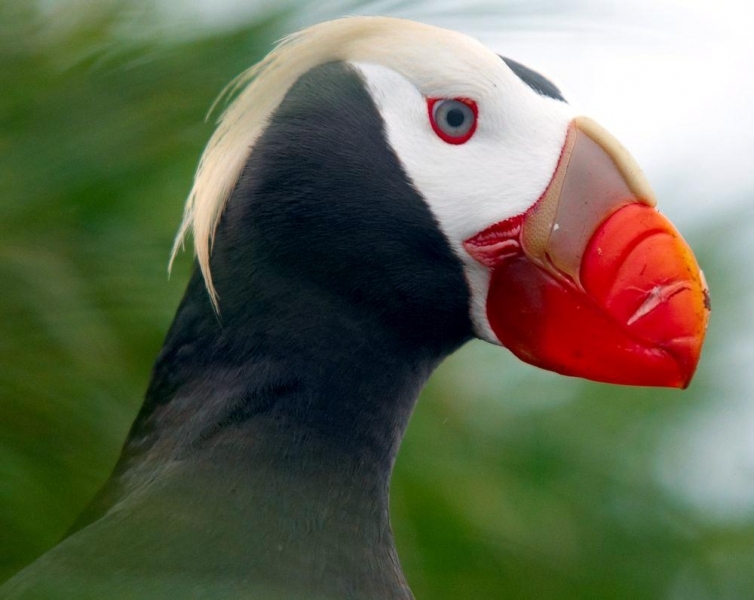 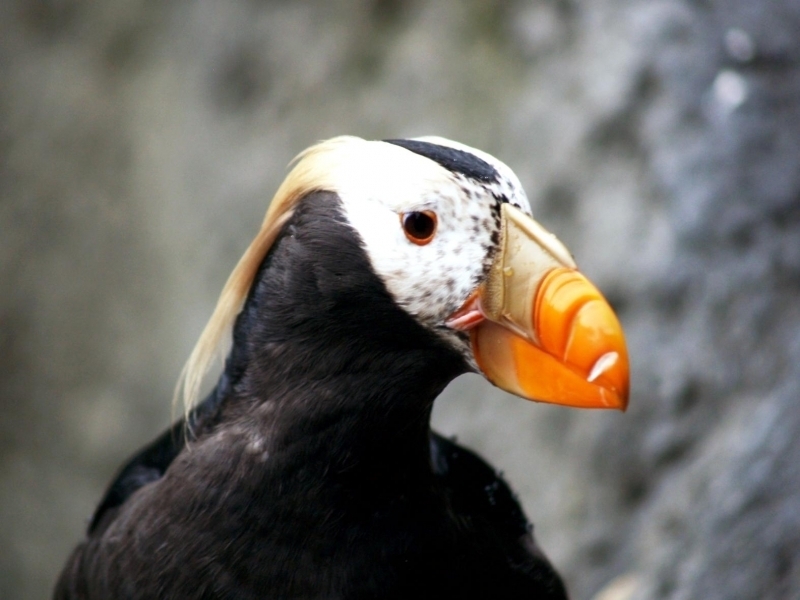 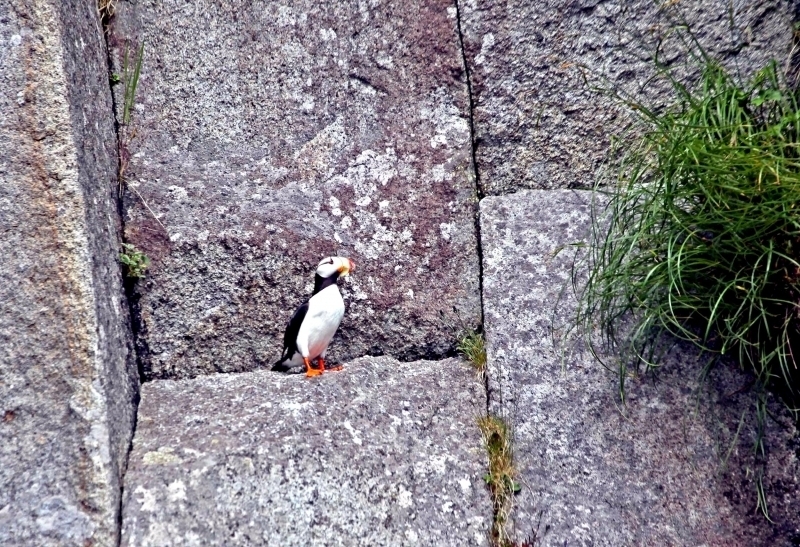 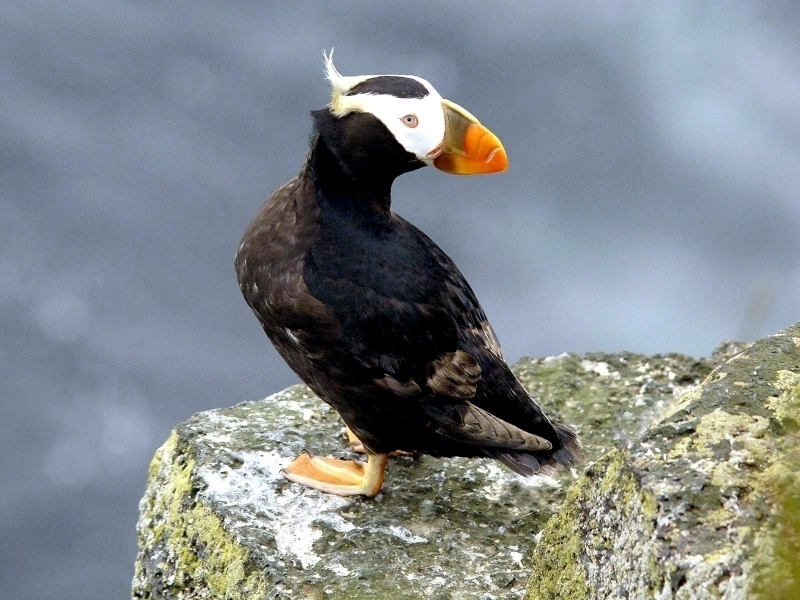 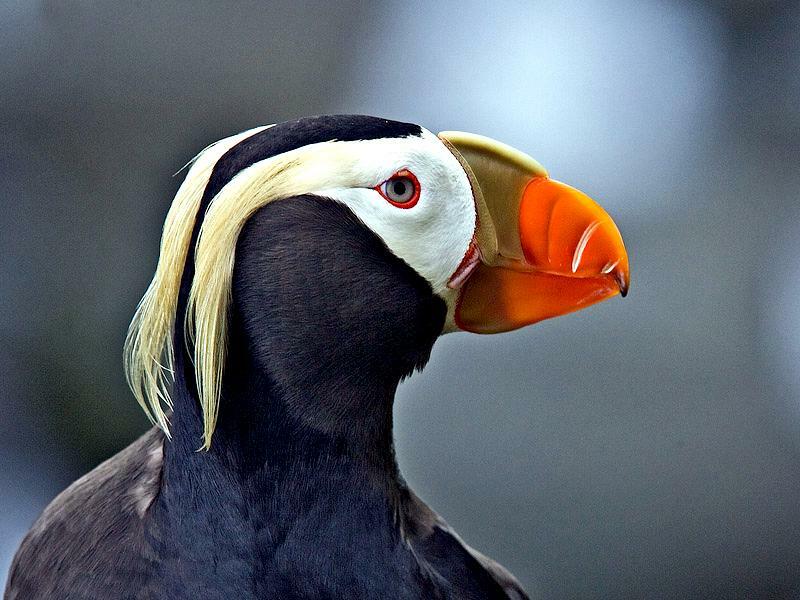 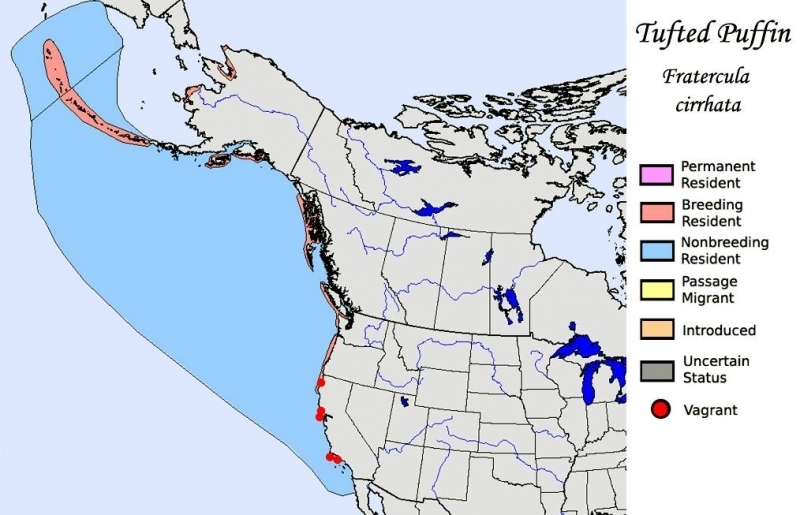 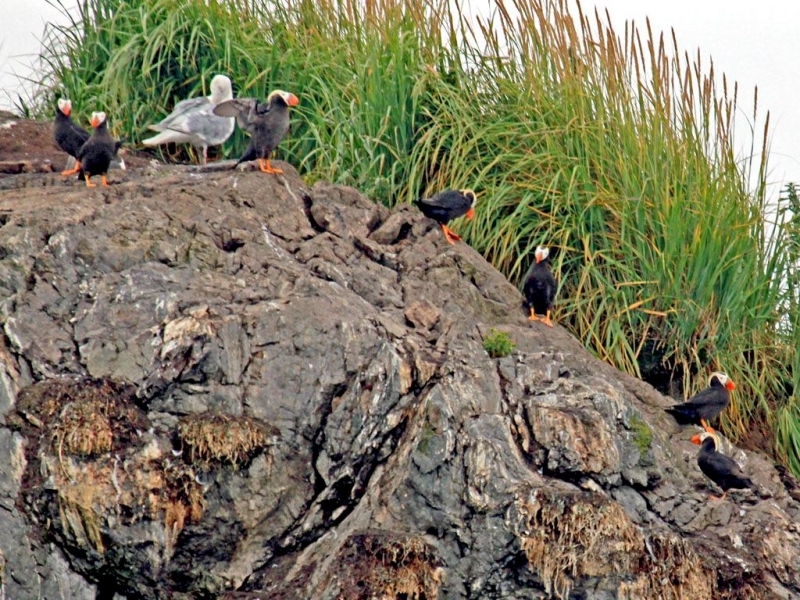 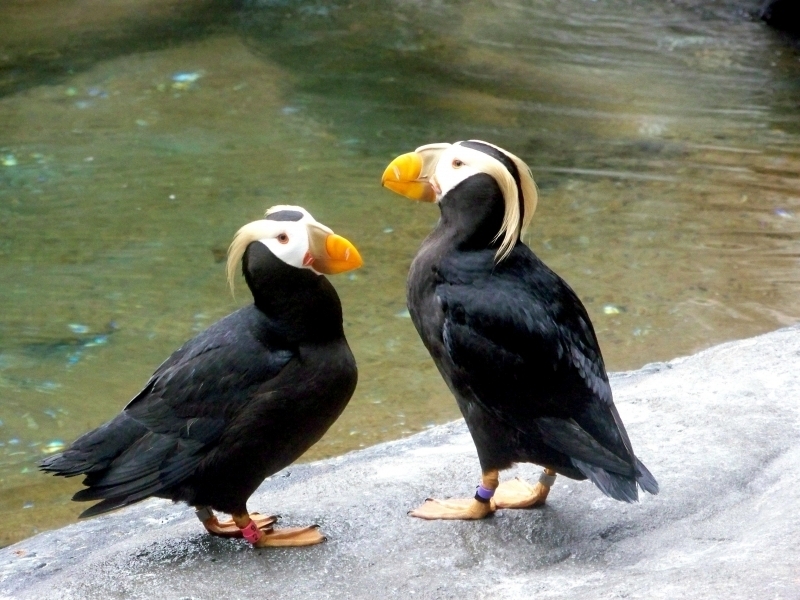 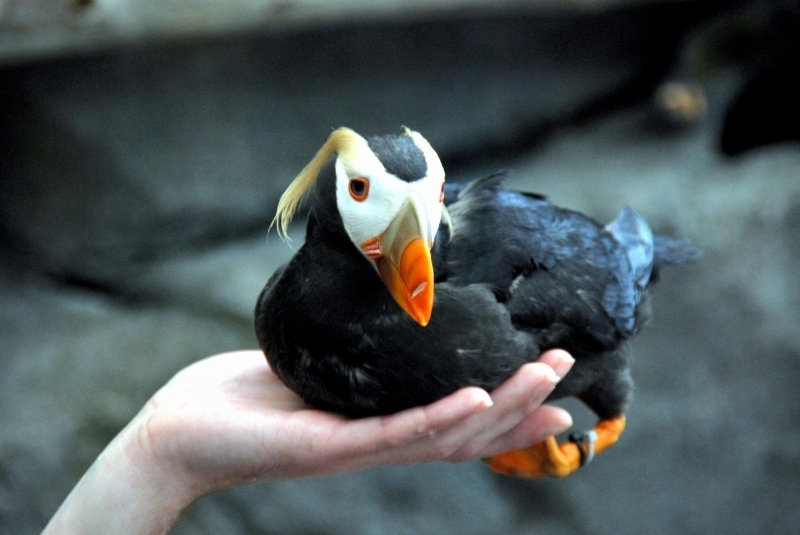 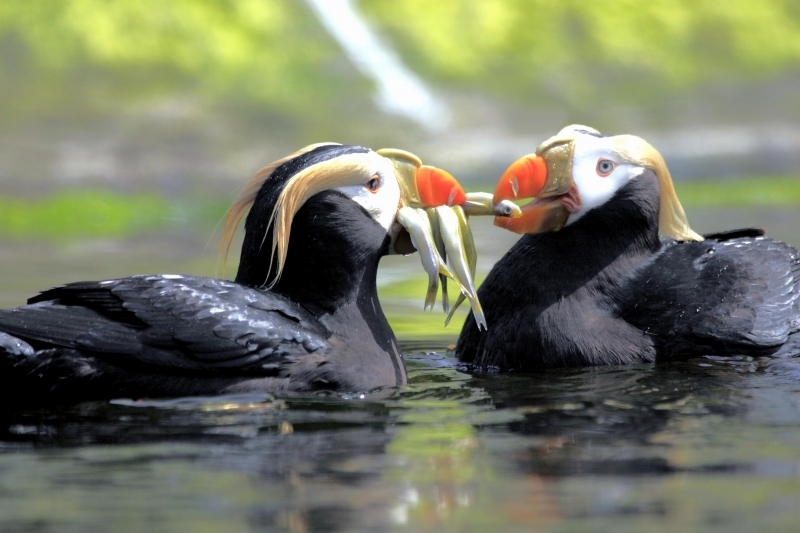 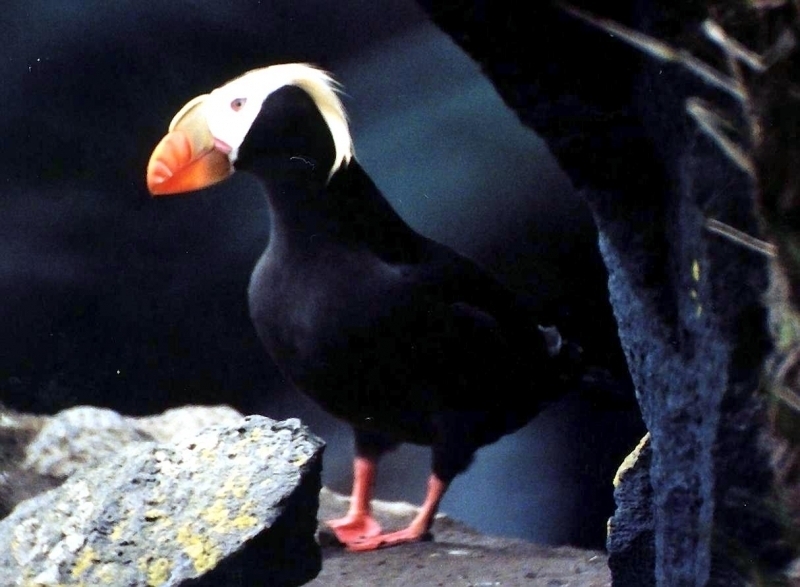 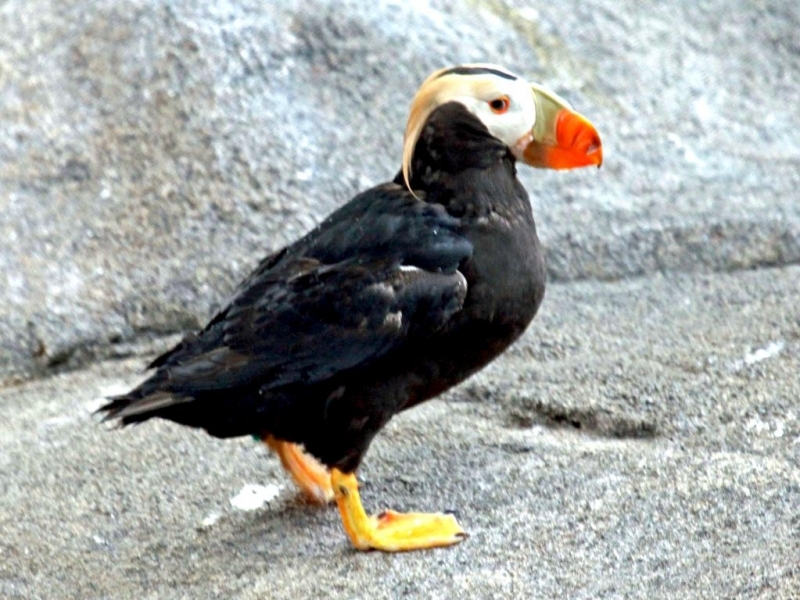 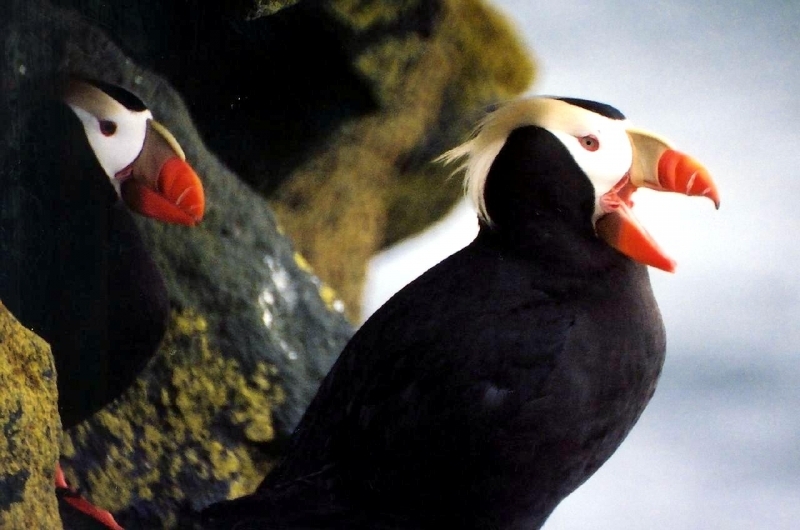 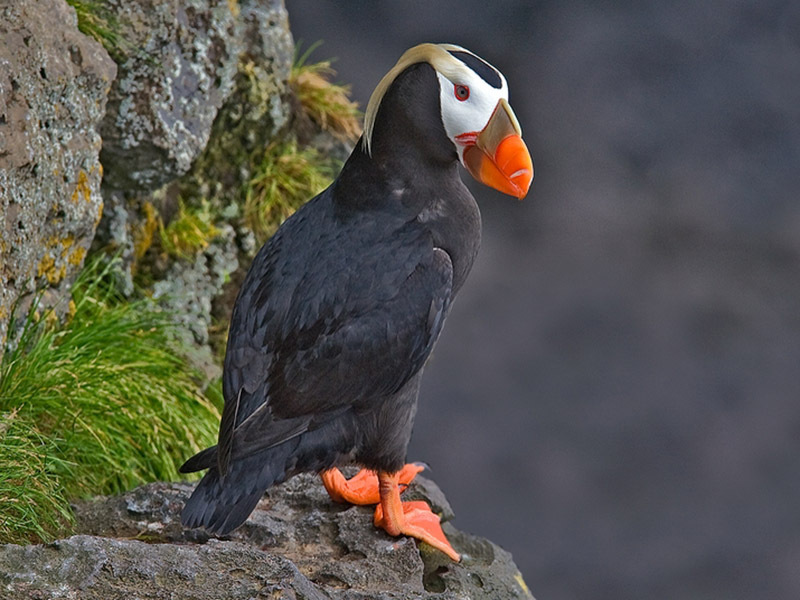 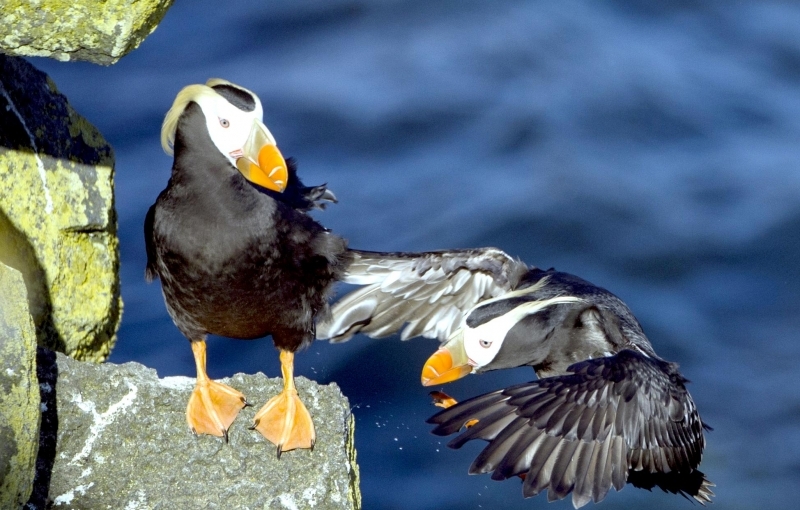 The Tufted-horned Puffin nests in burrows or tunnels on inaccessible rocky cliffs & offshore islands. 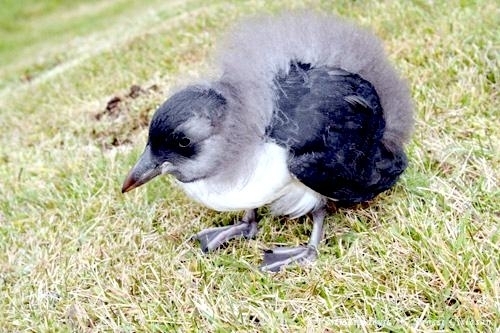 You’ll find them in dense, large colonies during the breeding season in the spring and summer. 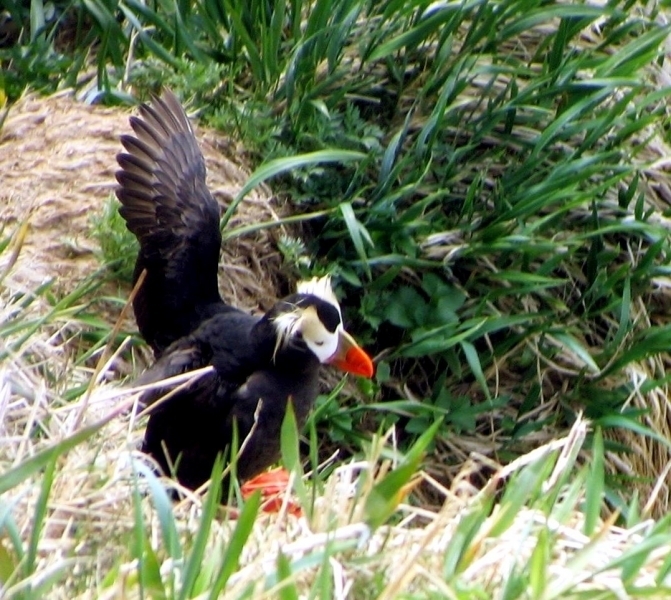 While nesting, they are very social, flocks of 10 to 25 birds may leave the colony to gather food for their mates & chicks. 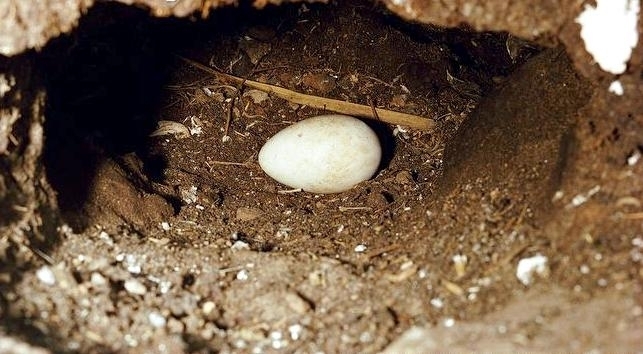 A breeding pair puts their energy into just 1 egg. 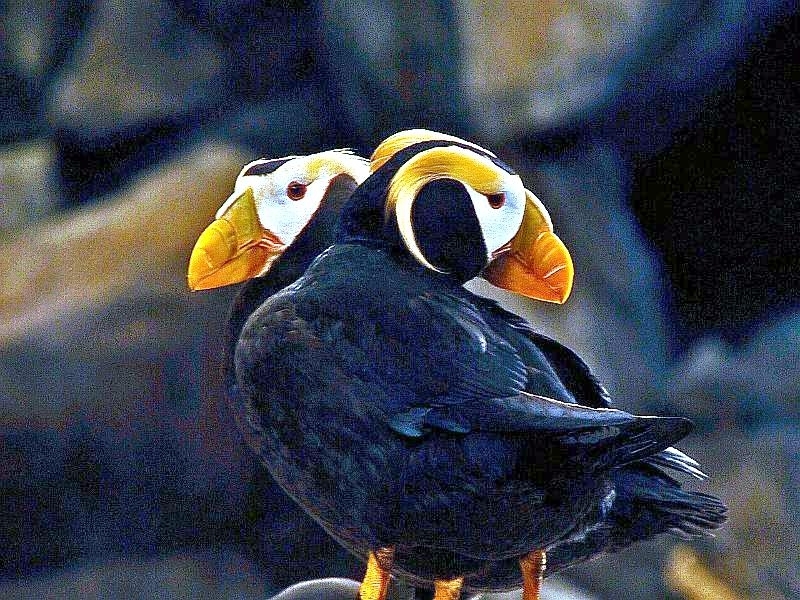 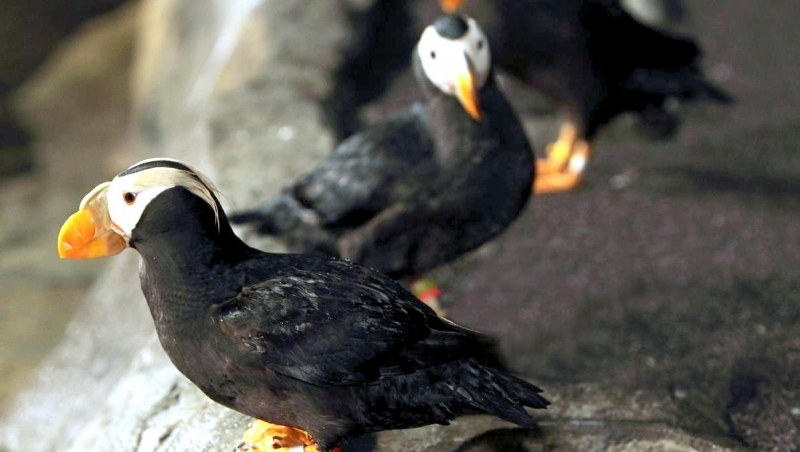 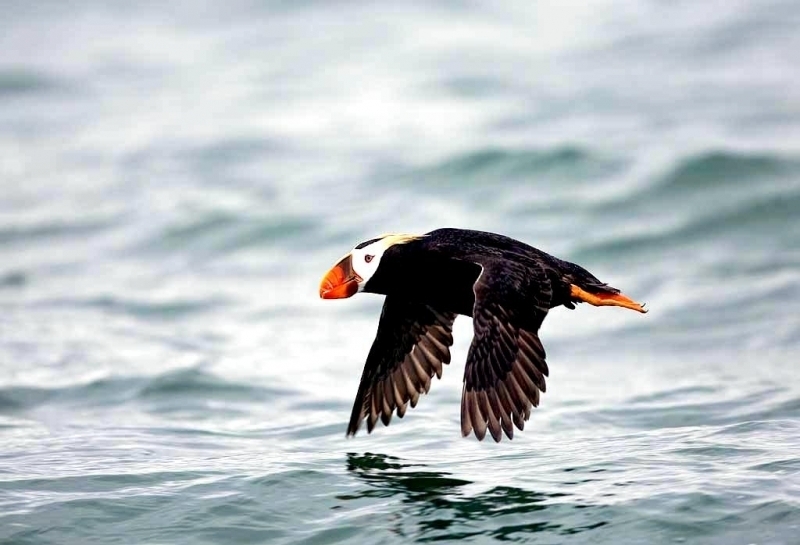 In the winter after the breeding season, Tufted-horned Puffins disperse far & wide and are solitary seabirds, venturing over the Central North Pacific while experiencing a range of conditions, from the frigid seas of the Bering Strait to subtropical waters off California. 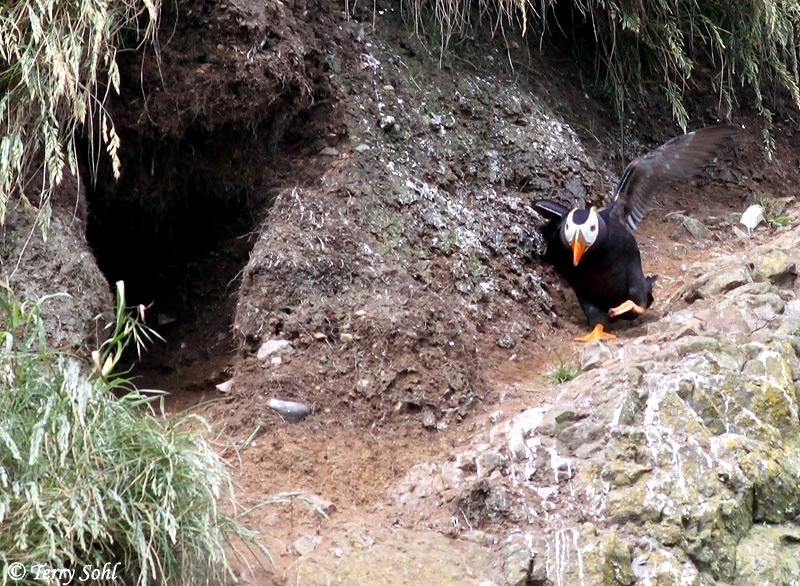 When it’s time to breed again, they’ll return to the colony where they were born and usually to the same mate. 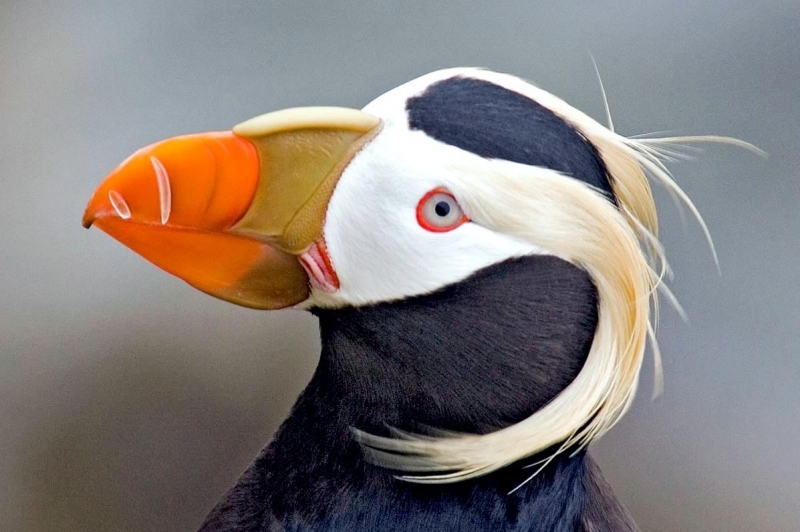 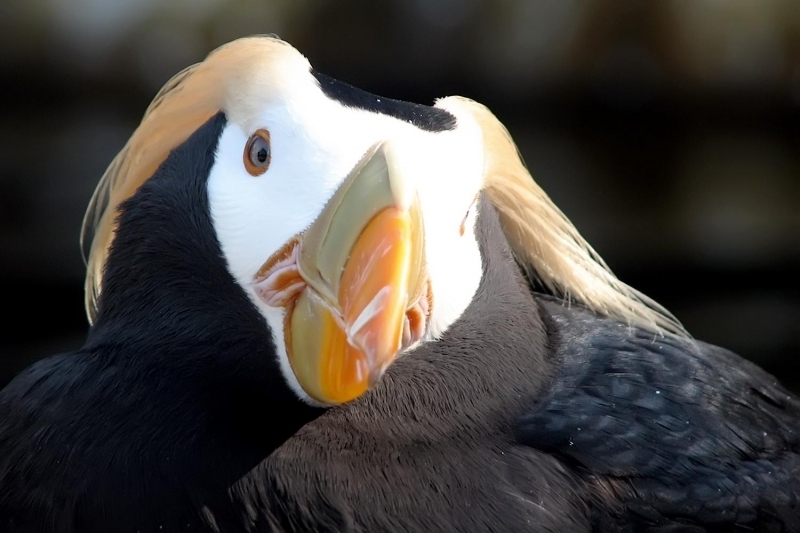 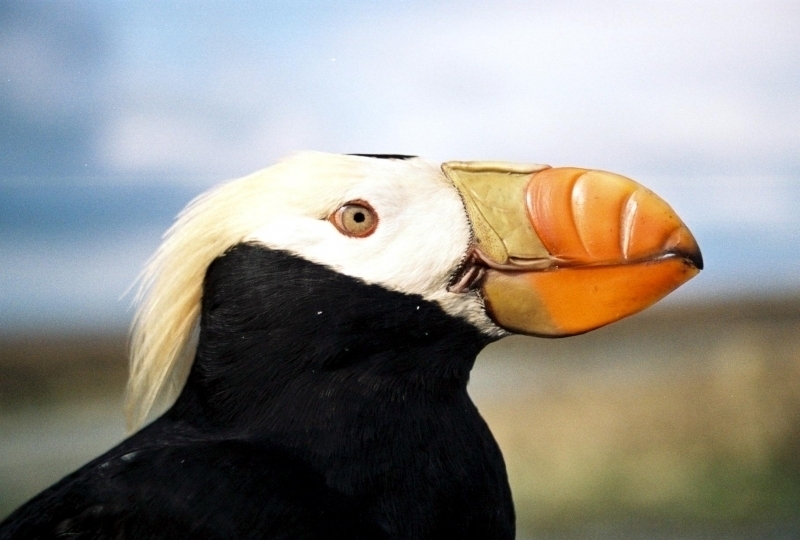 A Tufted-horned Puffin’s beak is specialized to hold many fish and its raspy tongue holds fish against spines on the palate, so the hunter is able to open its beak to capture more. 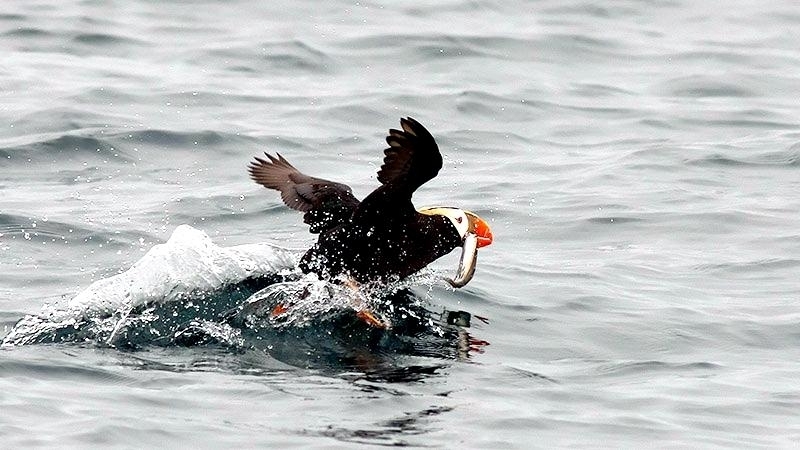 An average catch is 10 fish per trip. 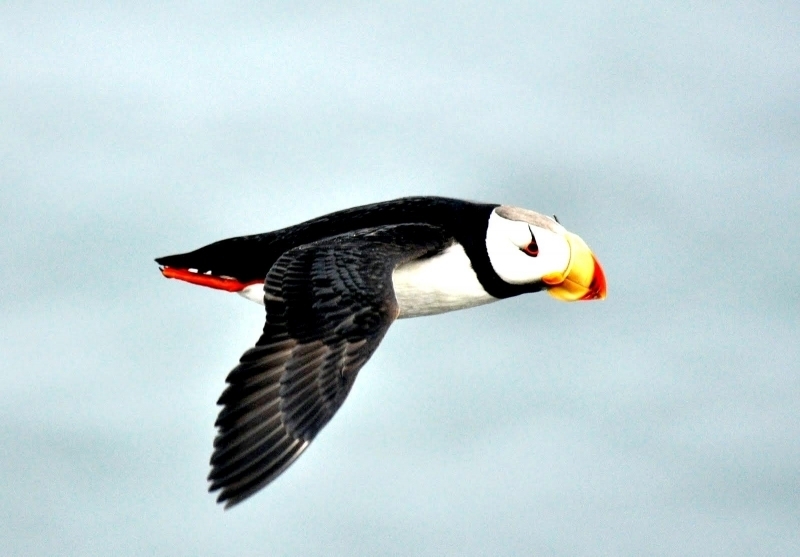 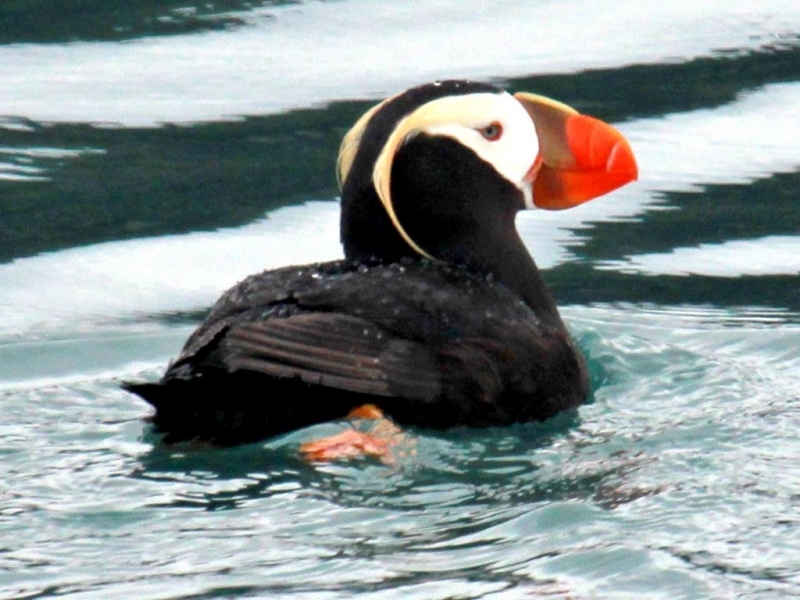 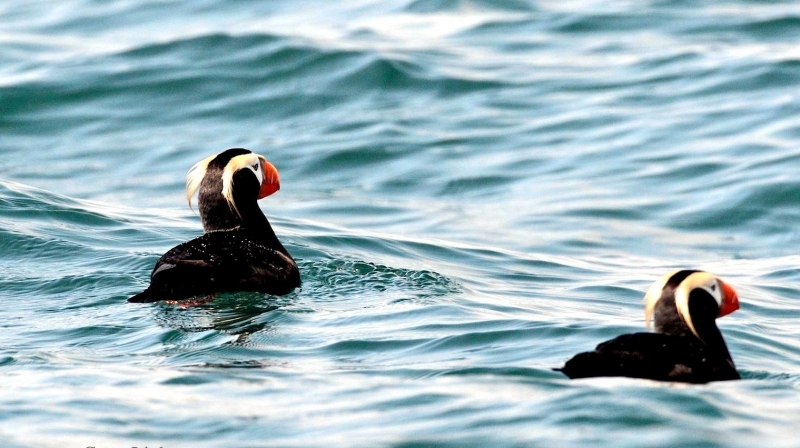 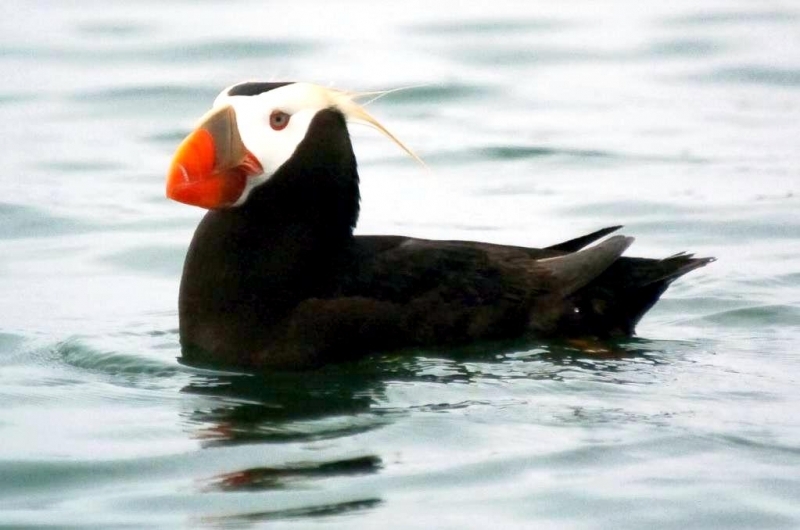 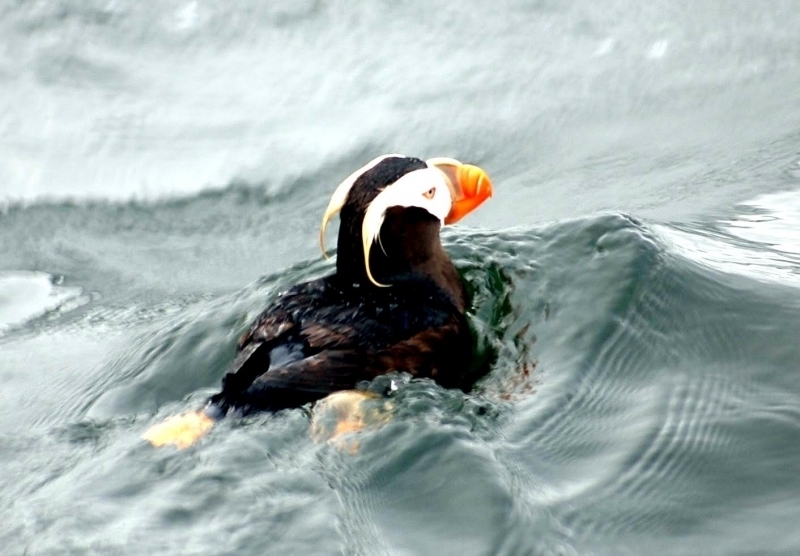 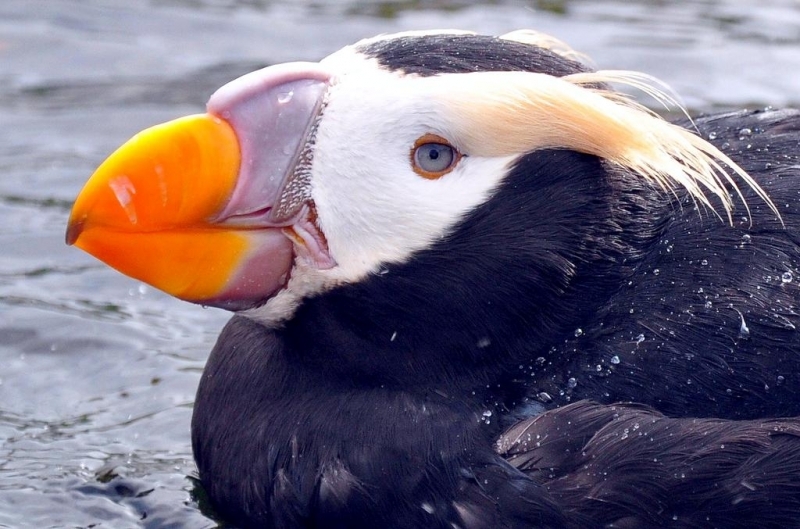 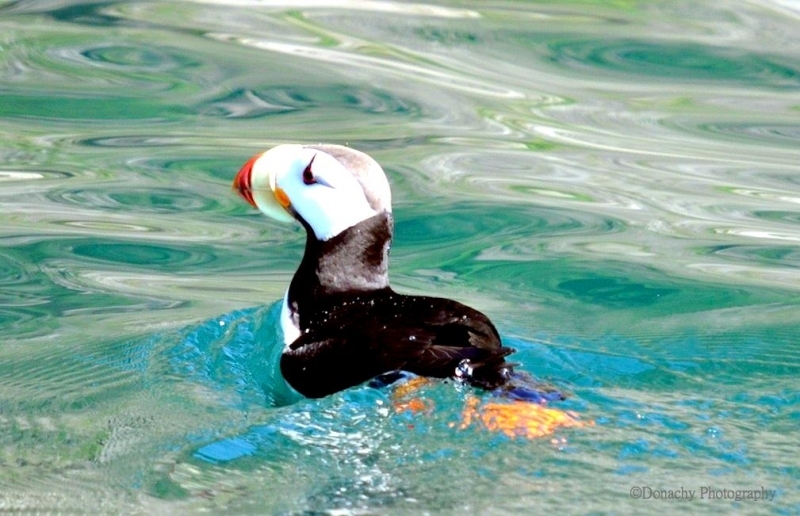 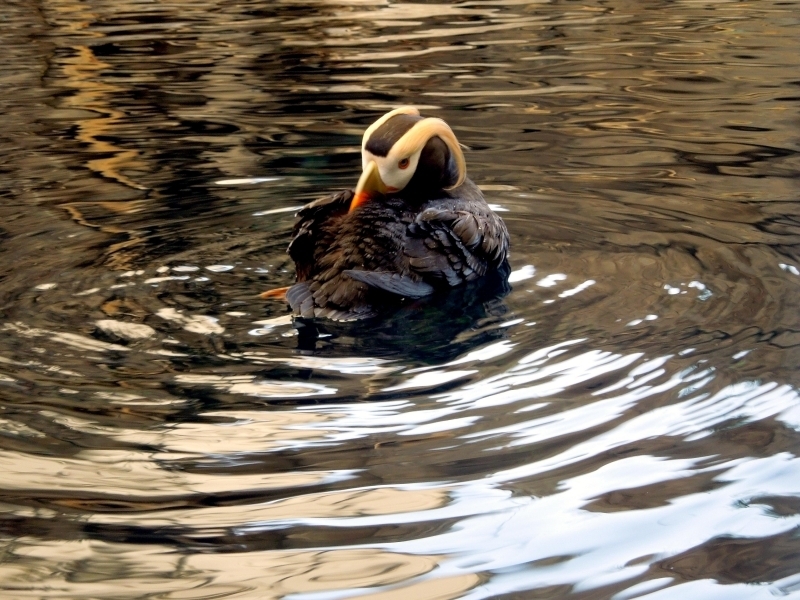 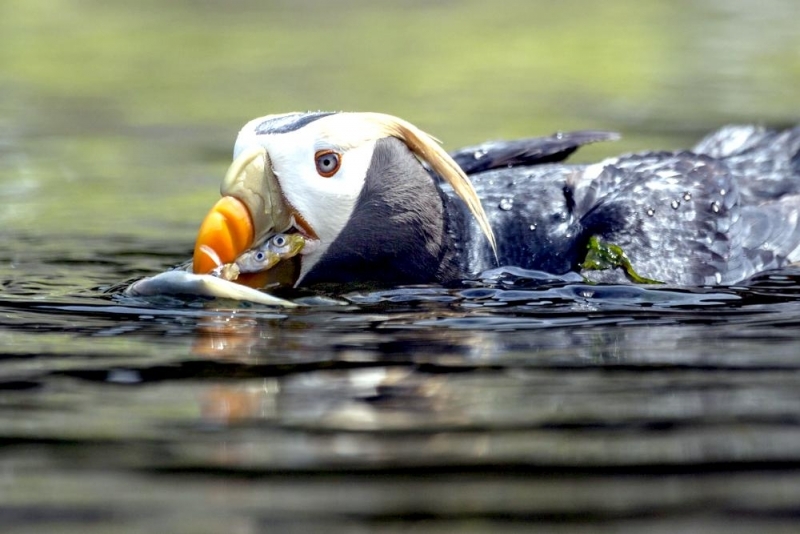 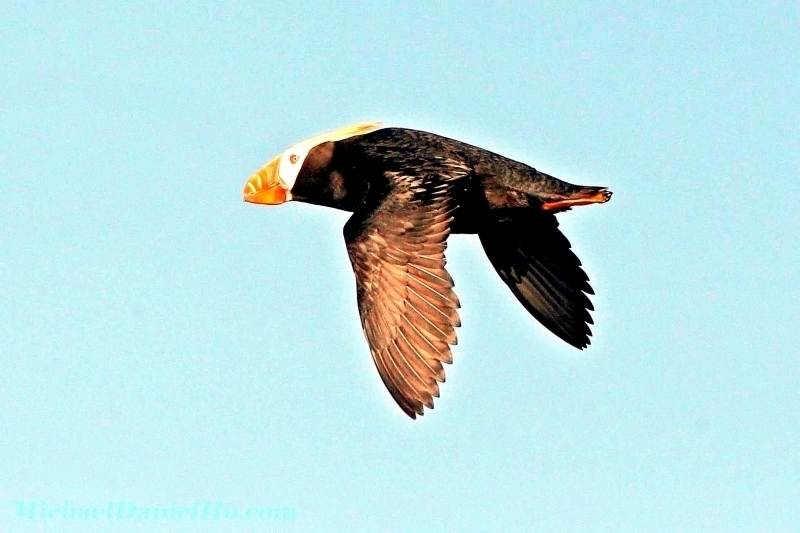 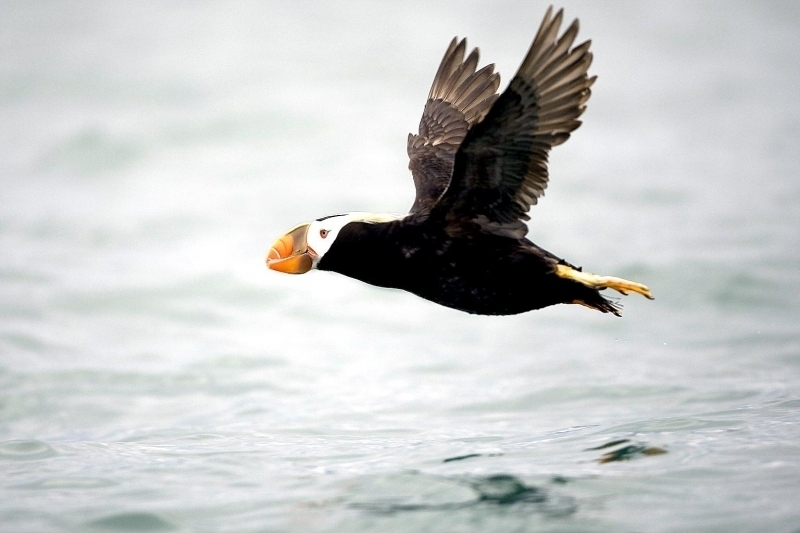 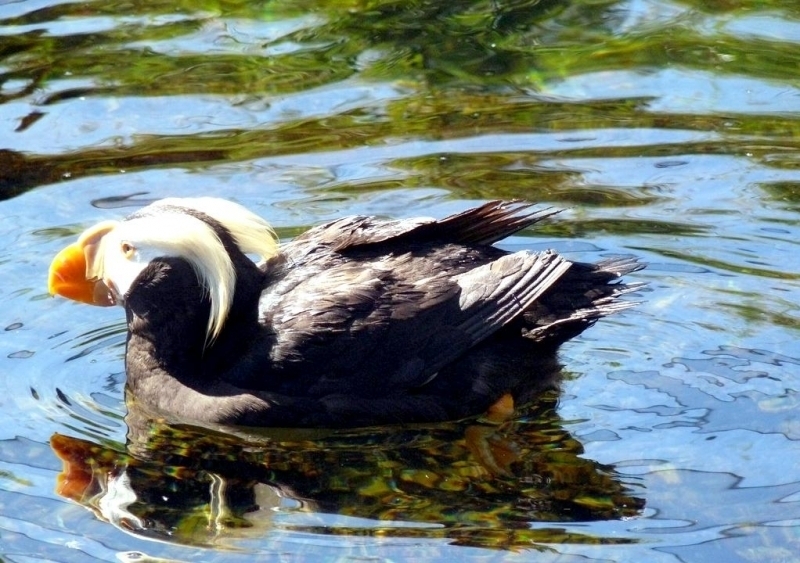 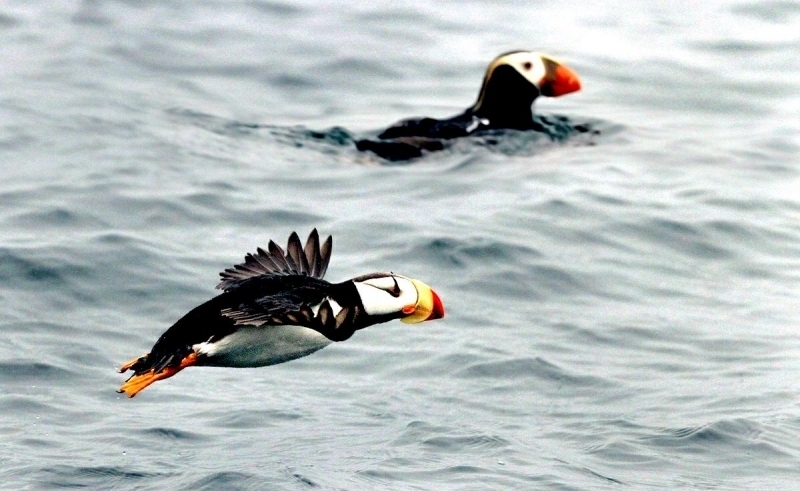 A Tufted-horned Puffin looks like a hybrid of a fish and a bird as it “flies” underwater. 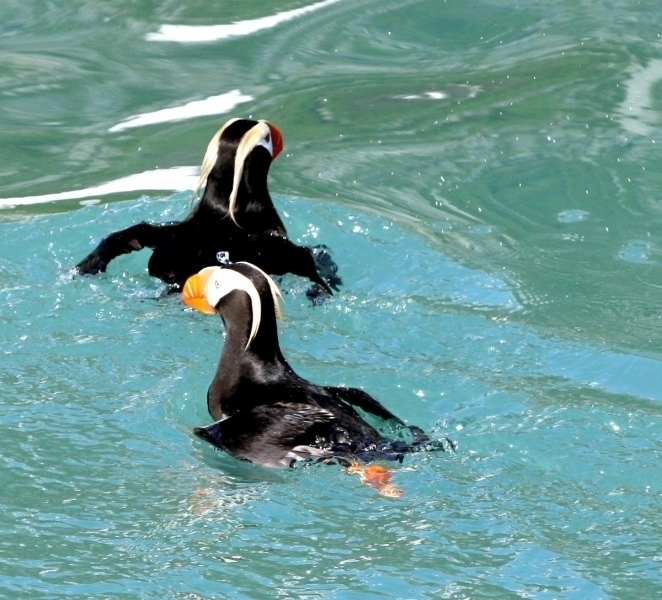 A typical dive lasts 20–30 seconds but Tufted-horned Puffins can stay underwater for up to a minute. 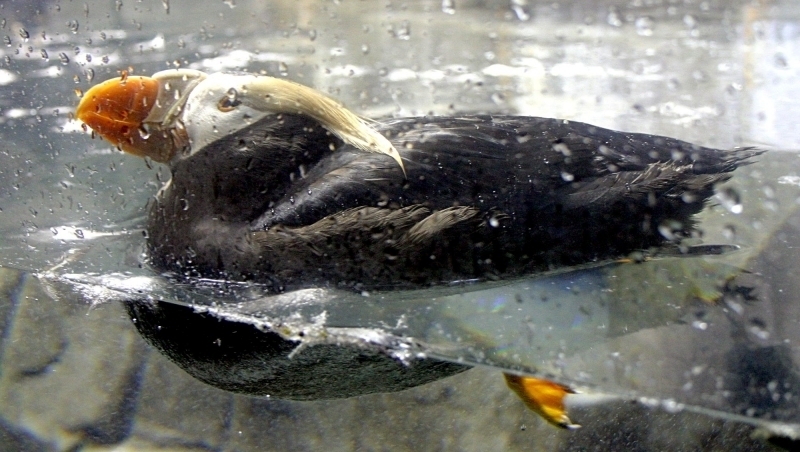 Heavy bones also allow them to dive deep in search of food. 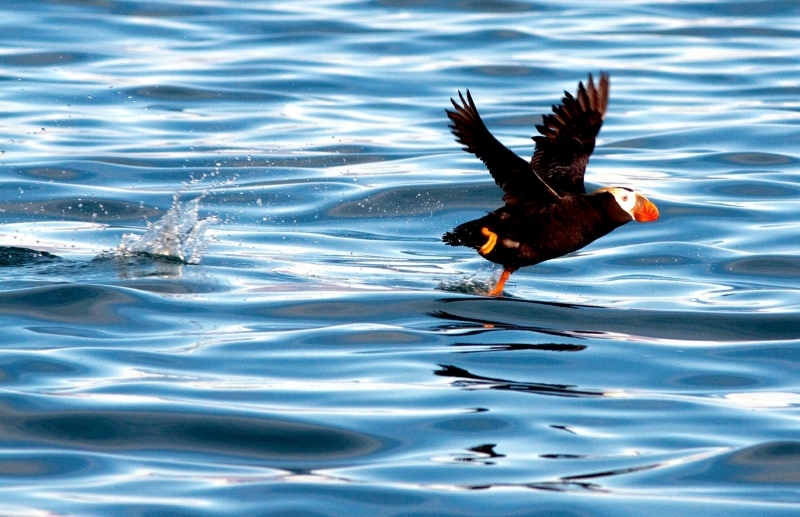 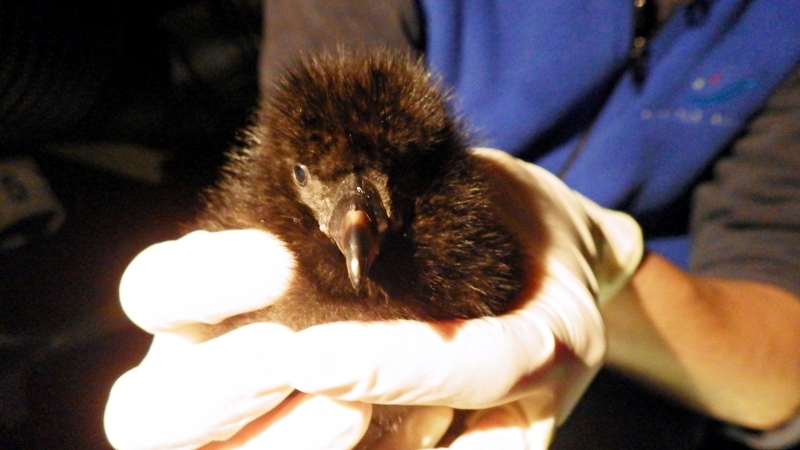 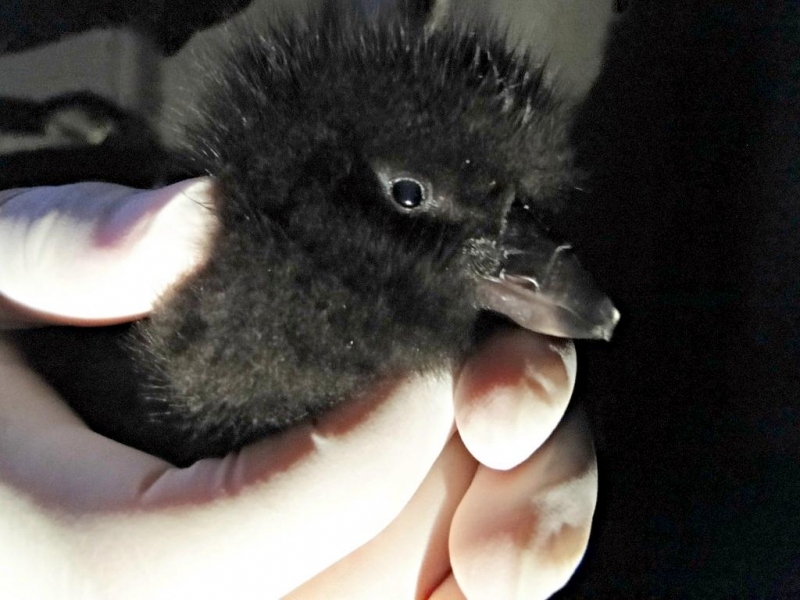 While scientists aren’t quite sure how deep they go based on similar diving seabirds, it may be as deep as 300 feet. 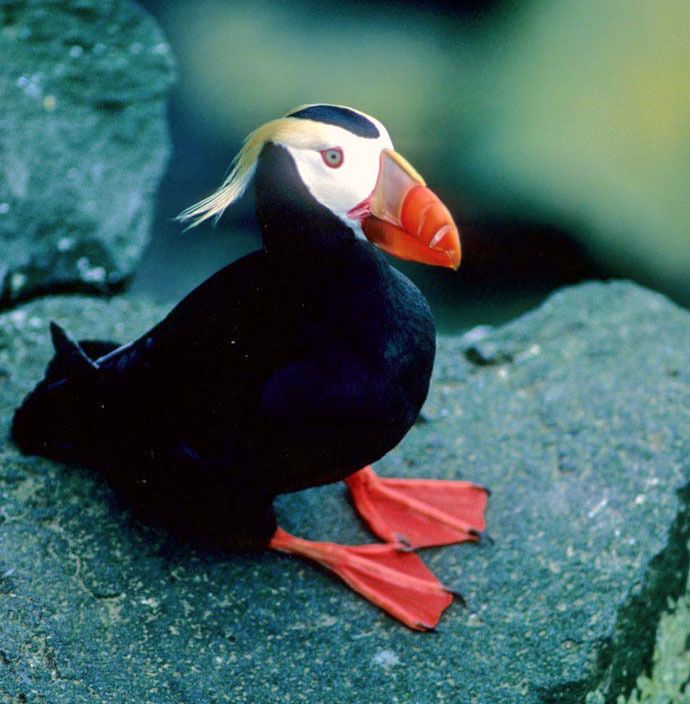 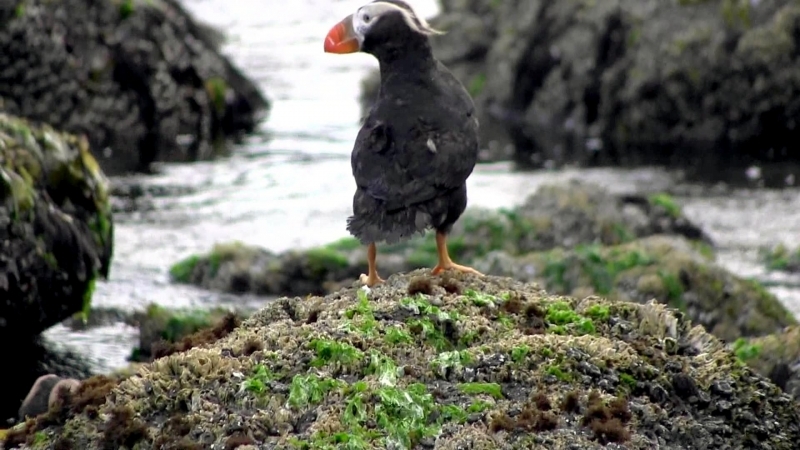 To nest on rocky cliffs, Tufted-horned Puffins rely on sharp nails on their feet to climb over rocks.